The Pennsylvania Turfgrass Council announces the winners of the 2018 PTC Student Scholarships. This year’s recipients are Nathaniel Leiby, Aleksander Schuler and Shawn Moore. Nathaniel’s hometown is Bloomsburg, PA. During his time at Penn State, he has interned with the Milwaukee Brewers at Miller Park and also at Whistling Straits Golf Course in Sheboygan, WI. 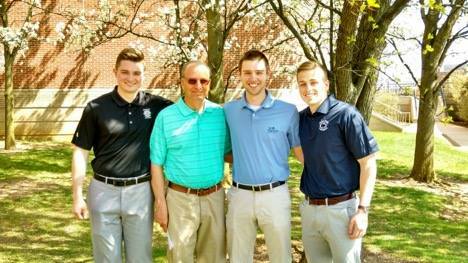 After graduation, he will continue at Penn State as a graduate student,pursuing a Master’s Degree in Agronomy under the direction of Dr. Max Schlossberg. Shawn is originally from Glen Mills, PA, and has interned for three summers with the Philadelphia Union Major League Soccer team in Chester, PA. He has accepted a position with the Philadelphia Union as a second assistant groundskeeper. Shawn’s career goal is to become a head groundskeeper in Major League Soccer. Aleksander is a native of Dryden, NY, and began working in the turf industry during high school at Robert Trent Jones Golf Course at Cornell University. As a Penn State student, he has worked at the Joseph Valentine Turfgrass Research Facility and has interned at The Old White TPC at The Greenbrier Resort in White Sulphur Springs, WV. After graduation, he will begin a full time position as an Assistant in Training at Oak Hill Country Club in Rochester, NY. Congratulations to our outstanding 2018 graduates and thanks to the Pennsylvania Turfgrass Council for their generous support.